Your imagination is the only limit on the number of ways to build (or find) a natural fort. If you’re just looking for a fun hideout, try searching for close growing trees or bushes you can crawl in or between and start your improvements from there. Rocky outcroppings may also have good hollows to start building in, just make sure you’re not invading the homes of any wildlife. 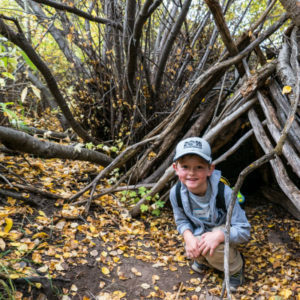 Make use of the materials around you—downed branches, fallen leaves, and so on can be used to construct your fort without hurting the plant life of the area. If you want to really put in some time and effort, upgrade from fun hideout to survival shelter by trying out some of these designs. Of course, since its November we have (or will soon have I hope) an abundance of one of nature’s greatest building materials: Snow! Again, your imagination is pretty much the limit here. As kids, my neighbors and I built many a snow fort by rolling snowballs nearly as tall as ourselves and placing them strategically between trees. You could also create blocks, or just pile up the snow in the shape of walls and pack it down. But whatever you do, don’t forget to stock up on ammunition (snowballs) to defend your creation. If a snowball fight is not so much what you had in mind, or, as is often the case with Colorado’s lovely powder, the snow isn’t particularly packable, you might try learning to build a quinzee. Be careful anytime you dig out snow and don’t work alone. Don’t have the time or energy for a full-size fort? No worries! Miniaturize your structure and call it a mouse house or fairy fort. You’ll still have marked your special spot, and you might have time leftover to decorate.